The so-called palace version (1877) of The Proclamation of the German Empire [Die Proklamierung des Deutschen Kaiserreiches] by Anton von Werner (1843-1915) was commissioned by the Grand Duke of Baden, along with other German princes, and presented to Kaiser Wilhelm I on March 22, 1877, as a surprise gift for his 80th birthday. Executed in a photo-realist style, the painting stood as a relatively accurate record of the actual historical event that Werner had been forced to witness, six years earlier, from the back of the hall (note that he inserted himself into the picture at the lower right). Indeed, pictorial accuracy was an obsession for Werner: in preparation for this painting, he executed no fewer than 128 individual portraits, each of which was cataloged so that viewers could identify specific figures within the large crowd of soldiers and dignitaries. In its straightforwardness and lack of drama, the painting accords with Werner’s own memory of the proclamation as a short, dull affair to which he had been summoned on short notice in the dead of winter. Perhaps the smallest glimmer of enthusiasm can be seen in his decision to depict the young officers at the very moment that they raised their helmets to cheer the newly-proclaimed emperor. 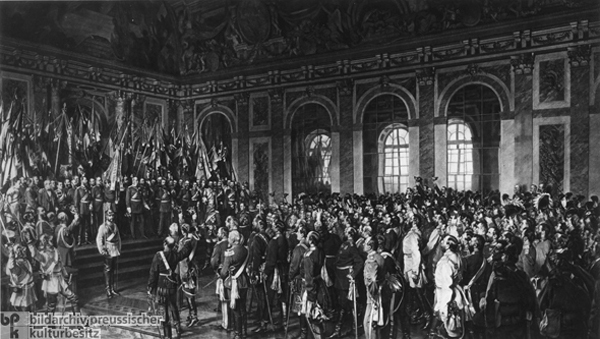 Otherwise, Werner allowed the massed military regiments – seen trooping through the palace’s “Salon de la Paix” – to overshadow the figures of Otto von Bismarck and Helmuth von Moltke (Chief of the Prussian General Staff). It is also noteworthy that, consistent with the moderate liberal inclinations of the Crown Prince and the Grand Duke of Baden, who took the lead in offering Werner this commission, this version balances the “national” and the “liberal” aspects of the event and downplays the ample opportunities afforded by the venue for expressions of German chauvinism (although contemporary viewers surely would have noticed that Louis XIV’s victories are depicted in murals on the ceiling). In this version, Wilhelm appears as primus inter pares with the other German princes for the first and last time, and it is clear that Werner took great pains to capture the details of the various military uniforms of Germany’s federal states. At 4.3 x 7.3 meters (14 ft. 2 in. x 24 ft.), this painting was larger than the later Friedrichsruh version of the scene. It hung in Berlin's City Palace for decades and was destroyed in the Second World War.